Just like our 4-link rear clips these ladder bar clips include a fixture welded frame custom built to your specs. Comes complete with upper & lower shock mounts, driveshaft safety loop, housing brackets, track locator and all necessary hardware. Ladder bars works well with virtually any chassis / body configuration. 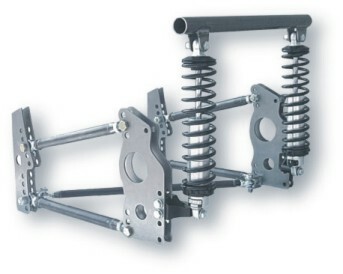 They are easy to install and much easier to adjust than a 4-link suspension.